SMIDGE OF THIS: Organized Perfectly. 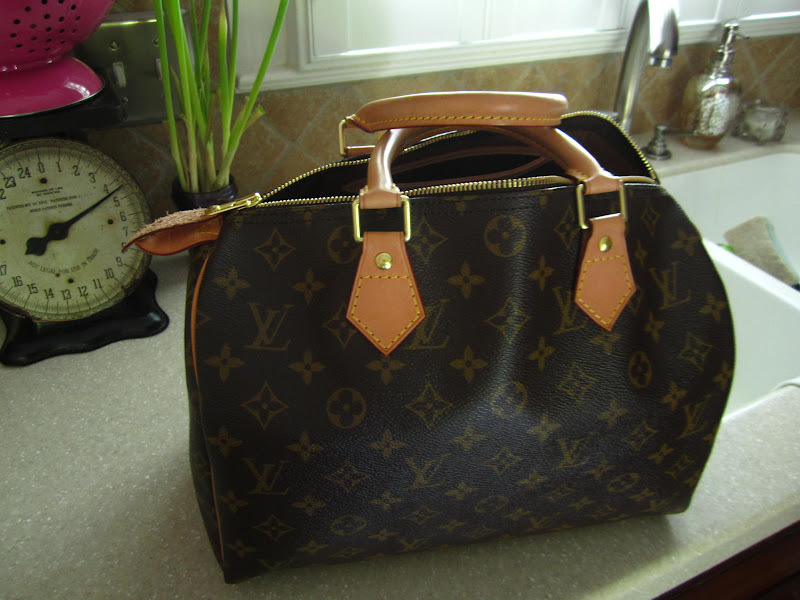 Back in late April, I made my big purchase -- my LV Speedy 30 (debuted here). I've absolutely loved it from the moment I said "I'll take it!". Before I walked out of the store with it, however, the sales associate did warn me about the eventual "bag sag" that it could develop. 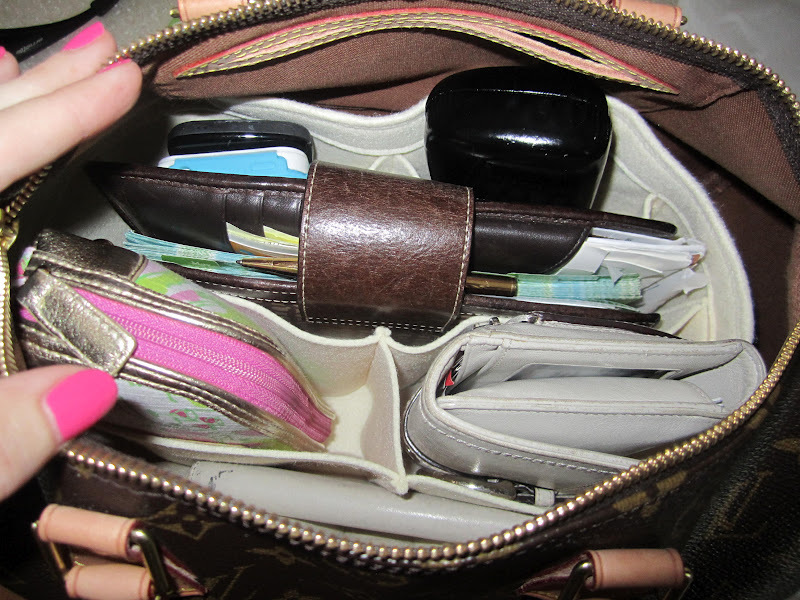 And being that I'm one to load down a large purse with quite a few items (the larger the bag, the easier it is to fill! ), it began to get weighed down pretty quickly. 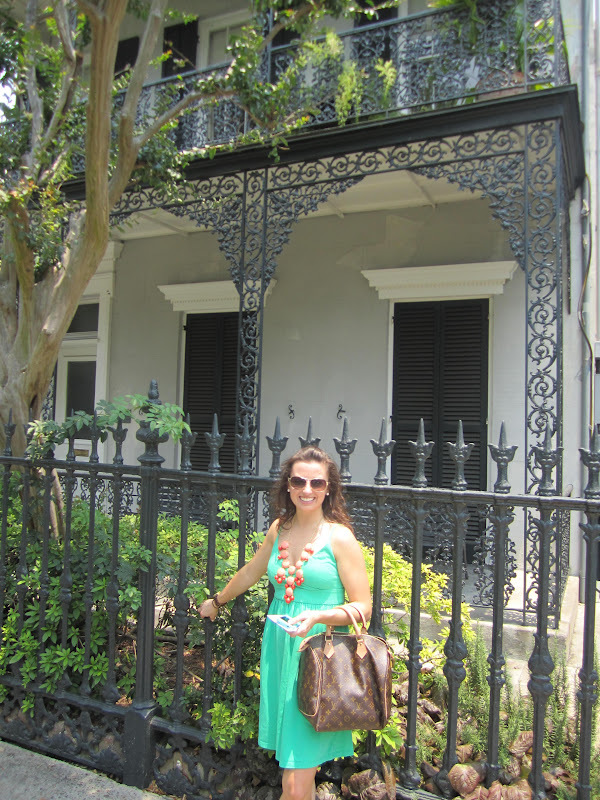 In fact, this photo from our recent anniversary trip to New Orleans (as seen here, here, and here) sort of made me guffaw at how quickly I was dealing with the dreaded bag sag. I mean, I know I do load it down with a heavy wallet, a large day planner, a plethora of lipsticks and glosses, sunglasses in their case, two phones, et cetera ... but my gracious. That wasn't pretty. That reason, combined with the fact that I wanted to keep the fabric interior free of ﻿pen marks and lipgloss smudges, led me to an incredible Etsy seller. 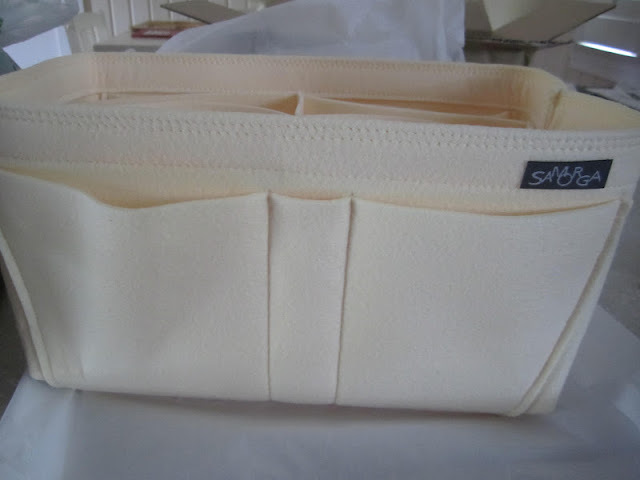 Samorga is a shop that carries really well-made felt handbag organizers. Some are especially sized for Louis Vuitton and Celine bags, but there are some other general-sized organizers as well. I ordered one fit for my bag and checked the mail every day for a package from South Korea. When it arrived, I was incredibly impressed with the quality! The felt is very thick and sturdy. I couldn't have designed the pockets to work better with what I carry on a daily basis. 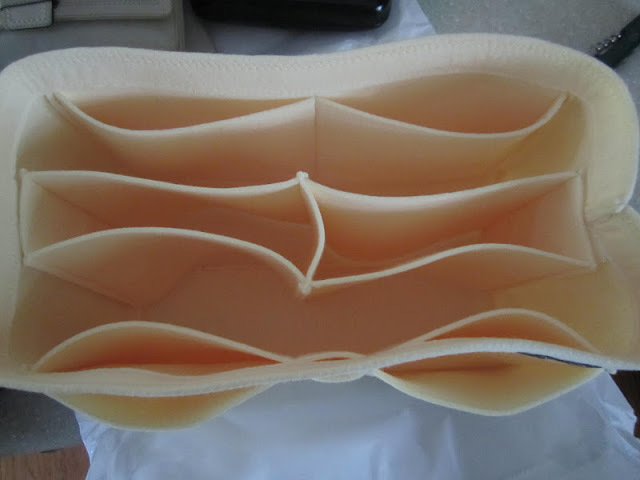 Additionally, that middle section you see below is attached with velcro and therefore removeable. It fit perfectly in my bag, and I started adding back in my contents. Now, the panicked search for my phone at the bottom of my bag to try to answer it before it goes to voicemail is OVAH! Also, even though I store my lipsticks and pens in a zipped pouch, I don't have to worry about one escaping and marking up the interior of my handbag. The best part for me is that it has really helped to restore the proper shape to the bag since the weight is now distributed proportionally and evenly. My organizer was $32.50 with shipping an additional $10. For me, that's an easy amount to protect my bag's interior and keep its shape. What's your handbag mojo, bottomless pit or organized perfectly? I so need one of those! It always amazes me what I have floating around in my bag! Thanks for the tip! What an awesome idea!!! Grandy and I have had lengthy discussions about bag interiors - we cannot get bags with black interiors because we can never find anything! 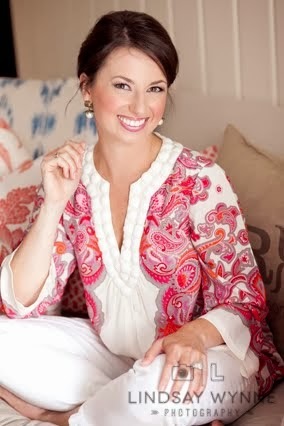 She would love one of these. I need two - one for my Speedy (TOTAL bag sag) and one for my Longchamp! WAY cheaper and better than the Audrey & Emma Speedy liner I considered buying. Thanks for the heads up! I know the panic phone search oh too well - Ryan ALWAYS makes fun of me for it. This is such a great idea! what a great idea!! now i really want a louie! I had one similar to this at one point and I have no idea what happened to it! I loved it because I change my bags frequently and I could lift it out and drop it into the next bag. Love, love, love! HOL-EE crap that foam organizer is amazing. It makes a huge difference on your bag. 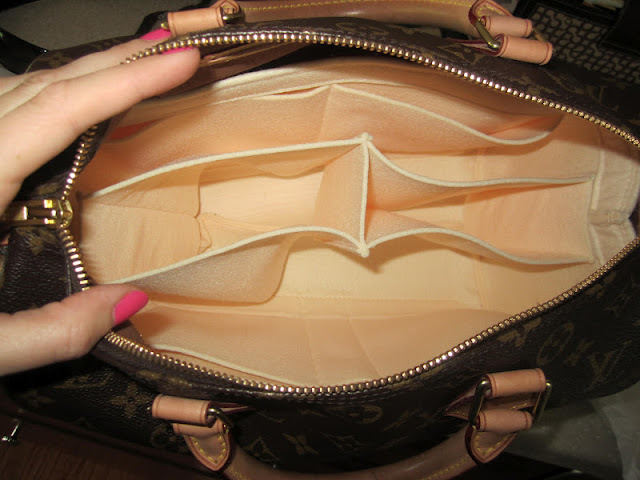 It is so funny you wrote about your LV because I have been eyeing a couple lately: the Papillon 26 and the Speedy 25. Still trying to decide which to get. Do you have any input? My bag is a mess. That is such a good idea! Wow, I cant believe the amount of bag sag and what a great idea! I have something similar that I carry in my handbag. This is fantastic! 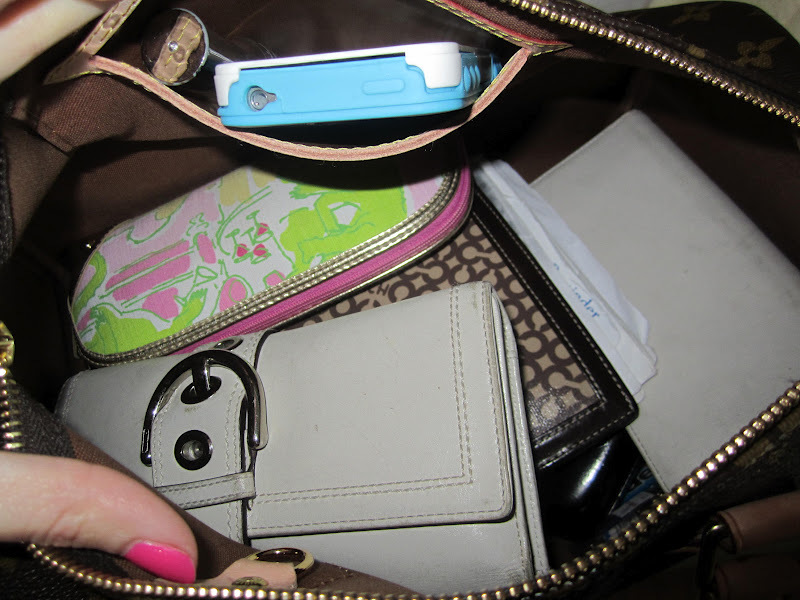 My purse is always such a mess. I tried organizing it with lots of little bags, but that gets overwhelming, too. I'm loving this organizer! This makes me want a speedy EVEN more!!! That organizer is amazing! I need one because my purse is a bottomless pit at the moment. Good find! Cracking me up one can write a post about a bag organizer... This is an awesome post on so many levels!! That thing is amazing! I have a speedy 30 which is always lovingly referred to as "the bottomless pit!" I'll definitely have to invest in one of those soon! ordering one ASAP!!! i've been saying i need someone to make things like this forever! That is awesome-- I'm ordering one now!! I just bought one off Ebay for my bag! Love it!